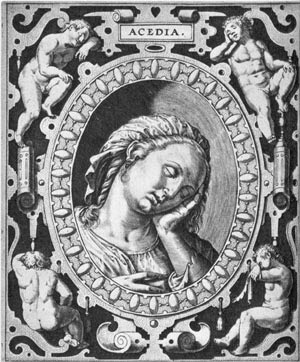 The subject of that vice known as ‘acedia’ (from the Greek, ἀκηδία), classically translated as ‘sloth’, but perhaps more accurately rendered ‘despondency’ or ‘listlessness’, is an enormous one, with an enormous literature to boot. The poet and writer on things ‘spiritual’, Kathleen Norris, recently followed up the brief chapter on the subject in her best-selling The Cloister Walk with an entire book devoted solely to acedia—Acedia & Me. A blog post is obviously a paltry thing compared to a book, and this is not the place to look for a comprehensive treatment. I intend merely to post a couple of passages on acedia from patristic authors that interest me, and one or two comments from modern writers on the subject. Our sixth contending is with that which the Greeks call ἀκηδία, and which we may describe as tedium or perturbation of heart. It is akin to dejection and especially felt by wandering monks and solitaries, a persistent and obnoxious enemy to such as dwell in the desert, disturbing the monk especially about midday, like a fever mounting at a regular time, and bringing its highest tide of inflammation at definite accustomed hours to the sick soul. And so some of the Fathers declare it to be the demon of noontide which is spoken of in the xcth Psalm [Ps 90:6 LXX]. The blessed Apostle, like a true physician of the spirit . . . busied himself to prevent the malady born of the spirit of accidie. . . . ‘Study to be quiet . . . and to do your own business . . . and to work with your own hands, as is commended you’ [I Thess. 4:11]. . . .
And so the wise Fathers in Egypt would in no way suffer the monks, especially the young, to be idle, measuring the state of their heart and their progress in patience and humility by their steadiness at work; and not only might they accept nothing from anyone towards their support, but out of their own toil they supplied such brethren as came by, or were from foreign parts, and did send huge stores of victuals and provisions throughout Libya, a barren and hungry land, and to those that pined in the squalor of the prisons in the towns. . . . There was a saying approved by the ancient Fathers in Egypt; that a busy monk is besieged by a single devil: but an idle one destroyed by spirits innumerable. Gray strikes me as standing more in the tradition of Robert Burton’s Anatomy of Melancholy, where the impression I have had is almost certainly one of a disease rather than a moral vice. Indeed, while I may be mistaken, I don’t believe Burton ever actually mentions the word ‘acedia’, whether in its Latin or Greek forms—an odd oversight for an author such as he. Anyway, I certainly find the history of this notion an interesting one and would love to pursue the matter further some day. Mine, you are to know is a white Melancholy, or rather Leucocholy for the most part; which, though it seldom laughs or dances, nor ever amounts to what one called Joy or Pleasure, yet is a good easy sort of a state, and ca ne laisse que de s’amuser. The only fault is its insipidity; which is apt now and then to give a sort of Ennui, which makes one form certain little wishes that signify nothing. But there is another sort, black indeed, which I have now and then felt, that has somewhat in it like Tertullian’s rule of faith, Credo quia impossibile est; for it believes, nay, is sure of everything that is unlikely, so it be but frightful; and on the other hand excludes and shuts its eyes to the most possible hopes, and everything that is pleasurable; from this the Lord deliver us! for none but he and sunshiny weather can do it. In hopes of enjoying this kind of weather I am going into the country for a few weeks, but shall be never the nearer any society; so, if you have any charity, you will continue to write. My life is like Harry the Fourth’s supper of Hens, ‘Poulets a la broche, Poulets en Ragout, Poulets en Hachis, Poulets en Fricassees’. Reading here, Reading there; nothing but books with different sauces. Do not let me lose my desert then; for though that be Reading too, yet it has a very different flavour. The May seems to be come since your invitation; and I propose to bask in her beams and dress me in her roses. Helen Waddell, tr., The Desert Fathers (NY: Vintage, 1998), p. 163. St John Cassian, The Institutes, tr. Boniface Ramsey, OP (NY: Newman, ), pp. 219-34. Here I like Ramsey’s translation—‘a wearied or anxious heart’ (St Cassian, p. 219). Siegfried Wenzel, ‘Akedia. Additions to Lampe’s Patristic Greek Lexicon’, Vigiliae Christianae 17 (1963), p. 176. Evagrius Ponticus, The Praktikos & Chapters on Prayer, tr. John Eudes Bamberger, OCSO (Kalamazoo, MI: Cistercian, 1981), pp. 18-9. Solomon Schimmel, The Seven Deadly Sins: Jewish, Christian, & Classical Reflections on Human Nature (NY: The Free P, 1992), p. 197.